With over 20 years of dental implantology experience Dr Ubhi has placed over 4000 implants (as of 2017) with a 97% success rate. We can offer your patients a comprehensive service. Working with some of the best laboratory support in Europe we are also able to deliver aesthetic excellence in the final restoration. We welcome and encourage the participation of the referring practitioner in all stages of the treatment. We are happy to mentor the referring dentist in this exciting field of dentistry and the referring dentist can even use the practice for the restorative phase under the guidance of our team. For patients and dentists who are exploring their treatment options. Patient is referred for hard and/or soft tissue augmentations prior to the referring dentists placing and restoring the implants. Implant is placed along with any augmentation procedures carried out by our practice. The restorative planning and treatment is carried out by the referring dentist. The patient is referred for all planning, surgical and restorative aspects of the treatment. 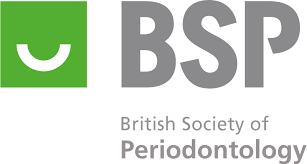 Why refer to BPI Dental? We perform all types of surgical implant procedures at our practice and these include implant placement, sinus and bone grafting. In addition we offer Teeth in a day or “All on Four treatment” concept as well Zygomatic implants. These very advanced procedures can be delivered with the care and respect due to the superb team and facilities available at our practice. Our team is well rehearsed with working in a sterile surgical environment and intravenous sedation is available for all patients for a more comfortable experience. 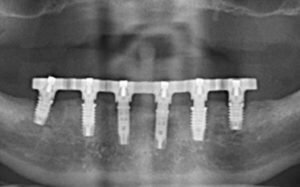 We have facilities at the practice for using a number of different implant systems (Dentsply Astra Tech, Zimmer Biomet, Nobel Biocare, Zygomatic Branemark system , ITI Straumann and Southern Implants). 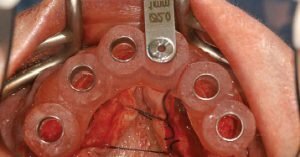 The use of different systems enables us to cope with any eventuality and also there is no compromise in your patient’s treatment since we are not affiliated with one particular system. For many patients missing all their teeth can have a devastating impact on quality of life. 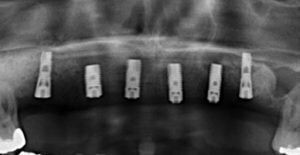 For replacement of all teeth we have 2 main options: A removable prosthetic denture secured on two or more implants using mechanical anchors or a bar. A fixed prosthesis consists of a dental implant bridge supported by four or more implants.